WASHINGTON, D.C. - “Washington Monthly” magazine named Webster University as among the best universities in the country, and the second best non-profit college for Missouri graduate students in its 2017 College Guide and Rankings, issued earlier this week. Webster was listed among the best national universities that help “non-wealthy” students attain marketable degrees. The magazine said its staff measured the “public good” that a University or College contributes in order to come up with the ranking. Three main factors were examined for the rankings: social mobility of the students, research, and public service. Out of the 632 schools listed in the “national master’s degree” category in the magazine, Webster University was listed at 265. When looking at universities and colleges in Missouri, Webster was listed fifth out of all institutions, and second for private non-profit institutions. The magazine also calculated a “Best Bang for the Buck” category, which was defined by the magazine as “an exclusive list of schools that help non-wealthy students attain marketable degrees at affordable prices.” In the Midwest “Best Bang for the Buck” category, Webster was at 182 out of 364 colleges and universities. In Missouri, Webster was ranked 18th in the state out of all colleges and universities, and 10th for all private, non-profit institutions. 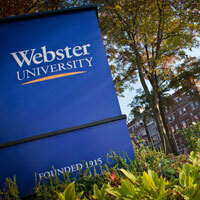 Webster University previously was cited for contributing to the success of low-income students. For the past few years, Webster was listed by US News & World Report as one of the top 20 colleges in the country with the most economically-diverse student body. In April, CollegeNET named Webster as the top institution of higher education in the St. Louis region and the sixth best private non-profit university for increasing a student’s social mobility, defined as the increase in the students earning power within five years after graduation, when compared to peers from the community who did not attend college. In May, the University was named by the St. Louis Regional Chamber of Commerce and St. Louis Graduates as one of the five best institutions in the region for graduating low income, first generation, underserved minorities with comparatively low debt. Webster University students and faculty are frequently cited in major news publications and broadcasts for their academic work. This summer, research conducted by students on the effect that weed killers had on the behavior of ants, as well as research by Professor Nicole Miller-Struttman on the movement of bees, made national news. Other recent recognitions of the scholarship and academics at Webster University include the chess program, the academic achievements in the athletic programs, and faculty research and academic expertise on topics as varied as the group dynamics of police departments, and the socio-political trends in Europe. For more information about the college ranking, visit http://washingtonmonthly.com/2017college-guide.